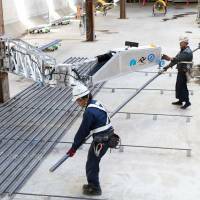 Construction sites in Japan are enjoying a wave of automation amid an increasing shortage of laborers, with the introduction of robots to do heavy lifting and drones that instantly collect aerial data. As the industry ages along with the country’s graying society, construction companies are forced to look for ways to boost productivity and efficiency. According to the Japan Federation of Construction Contractors, there will be 1.28 million fewer construction workers by fiscal 2025 compared with fiscal 2014. In 2015, some 30 percent of all construction workers were aged over 55, while those below 29 accounted for only about 10 percent, according to the Ministry of Land, Infrastructure, Transport and Tourism. 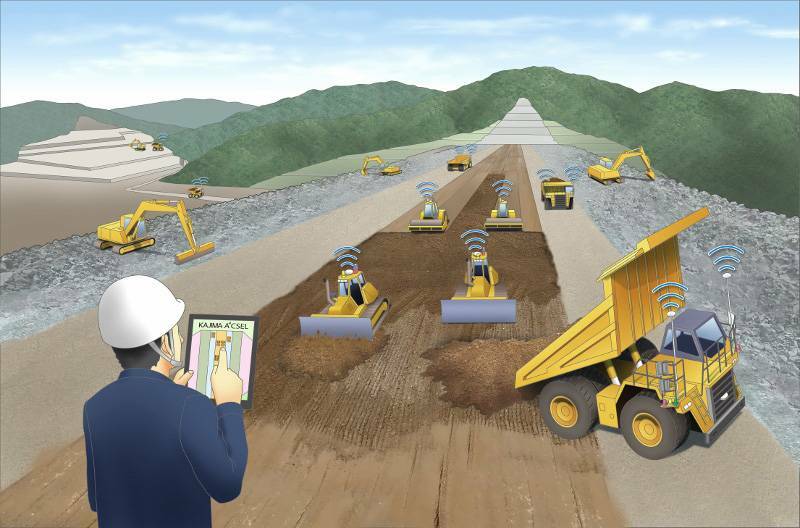 “We will probably have a total of 900,000 workers joining the industry within the next 10 years, but the 300,000 shortage will need to be covered by boosting productivity,” said Atsushi Fujino, a spokesman at major construction firm Kajima Corp.
Kajima has started using unmanned, automated dump trucks, bulldozers and vibrating rollers with GPS systems at its building sites. Using a tablet device, a worker directs the preprogrammed heavy equipment to carry out various tasks. Only one person using a tablet, for example, is required to operate a sequence of tasks carried out by five machines that dump soil, and compact and smooth surfaces. The automation ultimately leads to a higher level of productivity. Currently, the machines are being used on a trial basis on a construction site for a dam in Oita Prefecture. Shimizu Corp., another major construction firm, has developed an arm-shaped robot that lifts reinforcing rods. It usually takes six to seven people to carry one 200-kg rod, but using the machine it requires only three workers to direct the robot and move the rod. 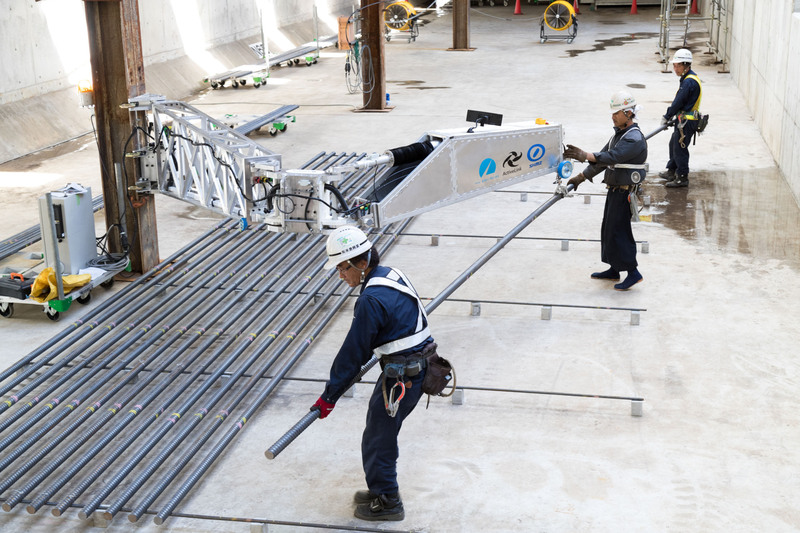 “This is a realization of human-robot collaboration,” said Tomoaki Ogi, a manager at the civil engineering technology division at Shimizu who helped develop the arm-shaped robot, which is now being leased out at construction sites. Even with technological advances, construction sites are still far from being fully automated. 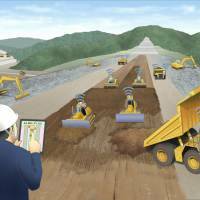 In fact, Kajima’s Fujino said he doubts that all tasks at construction sites can be done by machines. Shimizu’s Ogi agreed, saying every site was different in terms of area, soil or weather and each time a robot must be reprogrammed to fit new conditions. Construction sites are also not like the manufacturing industry, where robots are stationary and the tasks are identical, with products moving along an assembly line. Ogi suggested making use of the strengths of robots and humans, emphasizing that robots cannot understand nuances like their human counterparts. “Let the robot do the heavy work under people’s (guidance),” he said. Still, construction firms are hoping robots and building automation will encourage younger generations to join the industry. Young people have not been attracted to construction work because of the long hours, hard work and low pay. Yohei Oya, a 38-year-old construction supervisor at Shojigumi Inc. in Shizuoka Prefecture, uses robots and other automated machines. He said building sites were undergoing significant change. “Productivity has boosted by five to 10 times through automation and we’re not at the site all night like we used to be. You don’t even have to be highly skilled anymore to get the work done,” Oya said. Oya launched a network in 2015 that connects construction firms across the country that wish to try new technologies at their sites and share information. Thirteen companies have joined the network and use the latest technology, including drones that instantly offer a bird’s-eye view of a site and can be used for surveying and loading shovels with systems that dig soil to a set depth. The government has also been promoting the automation of construction sites by way of its i-Construction campaign. The infrastructure ministry said it will financially support public works projects that plan to use drones and other technology for streamlining works. The amount of support will be calculated based on cost estimates for the construction project. “When we think about the shortage of workers 10 years from now, this is the last chance for the government to invest and conduct radical reform (in the construction industry),” said Yasushi Nitta, senior deputy director of the ministry’s public works project policy planning.